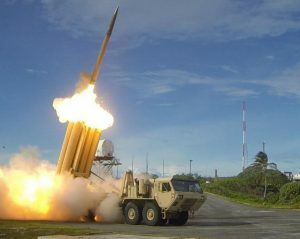 Saudi Arabia is likely to receive US advanced defense system Terminal High Altitude Area Defense (THAAD) in a deal estimated at $15 billion. The State Department Friday said it approved the deal, which is yet to be green-lighted by the Congress. Washington said the equipment will improve Saudi Arabia’s defense system against regional threats and Iran, which, through its ballistic missile program, puts at risk the region largely made of US allies. Saudi Arabia ordered 44 THAAD launchers, and 360 missiles, as well as fire control stations and radars. The order is part of the $110 billion military package signed by the two allies in May. US Lockheed Martin has been chosen for the contract while Raytheon will secure the deployment of the equipment. The new approved deal comes two days after Russia agreed to sell its S-400 air defense system to the Gulf power house. Moscow will also provide its cutting-edge military technology to Riyadh and help install a plant to produce the Russian Kalashnikov and its ammunition. Written by: KanelkaTagba on October 7, 2017. Posted by KanelkaTagba on Oct 7 2017. Filed under Gulf News, Headlines, World News. You can follow any responses to this entry through the RSS 2.0. Both comments and pings are currently closed.